The travel networks north of the Teifi are few and concentrated. In a car park last year at Rhug, outside Corwen, I met a writer who pressed me to see his upcoming play. Chance meetings on the Cambrian Coast line are regular. So, on March 22nd, it was not a surprise to meet a theatre veteran on the Shrewsbury-bound train. Talk revolved around this and that, present and past. With a vastly more extensive knowledge than my own my companion's view was that theatre overall in the 1990s was better than now. I demurred. In 2019 it is just different. The tour of Wales must surely now be our due. “Home I’m Darling”, Theatr Clwyd's co-production, moved across the Thames to St Martin's Lane where it continued to delight and impress. It was nominated for five Olivier Awards; Best New Comedy, Best Actress, Best Supporting Actress, Best Set Design and Best Costume Design. The awards are announced next Sunday. Prediction is a fool's game but my own estimate is that “Nine Night” will win the first and Patsy Ferran, or Sophie Okonedo, the second. For the third I reckon Monica Dolan will pip Susan Brown and the last Bunny Christie, or Es Devlin, will nudge ahead of Anna Fleischle. Whatever the outcomes Theatr Clwyd is mixing it with the very best there is. At the Stage Awards Hijinx won the International Award and Unsung Hero Award went to Pat Nelder of Theatr Clwyd. A pair of Welsh productions were well received at the Vault Festival. “The Wrong Ffion Jones” (below 25th February) and “How to Act Windy” from Eleri Morgan and Katie Pritchard. I was not at the Vault but I was at the Old Red Lion in Islington for Chippy Lane's scratch night. Last year I was at Theatre 503 as a reviewer, (below 19th February 2018), with a piece titled “The Grass Roots Are Irrepressible.” They still are irrepressible although this year I was there as a plain ticket-buyer, proud to contribute to Chippy Lane Productions. Theatre is event. The space was packed tight with the company's followers. Rebecca Jade Hammond made an exuberant host for an evening of all-women writers. 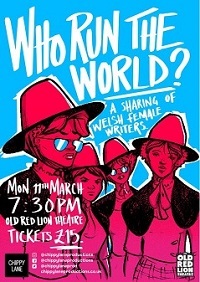 The roll-call of women dramatists of Wales is dismally short compared with Scotland and England. The brevity of the pieces meant a leaning to vignette over drama. But it felt at least like a report from the world of 2019, the one we actually inhabit. So the action roamed over erectile dysfunction, too-early parenthood, a testy relationship with a botoxed step-parent, pre-teens kisses traded for cigarettes. The background is a world of children's centre closure, a branch of a coffee chain taking its place. Chippy Lane also delivered a very small first. On 6th May 2016 the politics of Wales diverged from the other nations. One in six voters chose a non-traditional party, the corresponding levels in Scotland and England being 2%. This is unreflected in the arts; a prime reason is that the state culture is primarily concerned with projecting the goodness and virtue of Wales. This makes for dreary art. It is a minor thing but one of the women authors described a character as “lippy and ukippy”. There is a symbolism in that a Welsh actor gets to speaks the line in a London venue. The effervescent evening was made up of: “Blue Planet” by Catrin Lowe, directed by Lucy Bird. “A Question of Faith” by Amy Loughton, directed by Mark Fleischmann, “Splinter” by Katie Elin-Salt, directed by Neal McWilliams, “Celtic Manners” by Paisley Jackson, directed by James Dunham, “Can Onions Eat Hamsters?” by Frankie Williams, directed by Callie Nestleroth, “Scheming” by Kirsty Roderick, directed by Julie Barnett, “Eros (********) by Hannah Daniel, directed by Chelsey Gillard,“Vera Jones” by Martha Reed, directed by Siobhan Brennan, “Sin Eater” by Melissa Berry, directed by Chelsey Gillard, “Grandparenting” by Elizabeth Adlington, directed by Siobhan Brennan, “Two Flats on “Clifton Street” by Faebian Averies, directed by Ed Hartland, “Drama Queen” by Sophie Morgan Price, directed by Jamie Jackson. Sophie Hughes produced with support from Jacob Hodgkinson. Hodgkinson and modernity feature too in RWCMD's range of 4 new plays heading for London's Gate in the first week of April. Jacob Hodgkinson's contribution “Between Eternity and Time” is not one to have the theatre-as-a-subsidiary-of-the-Wales-tourist-board lobby too enthused. Its subject is the County Lines network, which is now predominant across Wales. Royal Welsh College of Music & Drama was also in Manhattan for St David's Day. It was marking its 70th birthday, The dress was glitzy, young performers sang, a new scholarship, the Catherine Zeta-Jones Scholarship, was launched. Matthew Rhys was present, so too Kate Burton, Iris Williams, and a legion of the College's friends and supporters. Other references- the Guardian at the Linbury Studio for National Dance.